Medical Beds Market size is set to exceed USD 4 billion By 2025; according to a new research report by Global Market Insights. Increasing geriatric population which is highly susceptible to chronic and infectious diseases will serve to a significant impact rendering factor in the medical bed market growth. According to World Ageing Population, in 2017, 962 million people were in the age group of 60 years & above and is poised to show substantial growth by 2050. Majority of the elderly population suffering from chronic diseases and physical disabilities will fuel the demand for durable medical bed for their routine activities. Additionally, weakened immunity along with rising prevalence of infectious diseases will foster business growth over the coming years. Rising prevalence of chronic diseases including cardiovascular diseases, diabetes, cancer, chronic respiratory disorders and stroke will serve to be positive impact rendering factor in the industry growth. Chronic diseases leading to rise in the number of hospital admissions for proper and effective patient treatment will favor revenue growth. Increasing disposable income along with advancement in healthcare infrastructure will further spur the business revenue. However, low volume of bed in public hospitals, especially in developing and underdeveloped countries may negatively impact the business growth. Acute care bed segment is anticipated to show more than 6.5% CAGR during the forecast timeframe. Rising geriatric population and increasing incidence of disabilities in individuals will surge the demand for acute care bed. Delays and prolonged waits are common in acute care settings. Increasing adoption of diagnostic and therapeutic services in hospitals and clinics will further augment the demand for these beds. However, many countries in developed region are facing problems in providing hospital care in a timely manner due to significant reduction in acute care bed numbers. Such factors should accelerate the segment growth during the forthcoming years. Manual bed segment held considerable revenue in 2018 and will around 5.8% CAGR by 2025. Increasing use of manual hospital bed as a cost-effective means of delivering similar level of comfort with no risks of power loss, electrical failure and expensive maintenance will boost the industry size over the forecast period. Growing use of manual bed particularly in-home care will propel the segmental business. Intensive care segment was valued more than USD 1.3 billion in 2018 and is projected to show lucrative growth during analysis timeframe. High demand for intensive care services and rising focus on bed availability to address capacity planning challenges will drive the business growth. Rising focus on better patient throughput, improved bed availability, maximum flexibility of bed placement and access to intensive care bed for optimizing utilization of ICU capacity will spur segment size during the forthcoming years. Hospitals segment accounted for more than 65% revenue share in 2018 owing to increasing number of surgical procedures carried out in hospital settings. For instance, according to AHA Hospital Statistics, 2019 edition, number of hospital admissions in the U.S. exceeded 36 million in 2017. Moreover, mandates pertaining to hospital available bed for emergencies and disasters (HAvBED system should be implemented and supported on a national level. Such factors should drive industry growth over the forecast period. 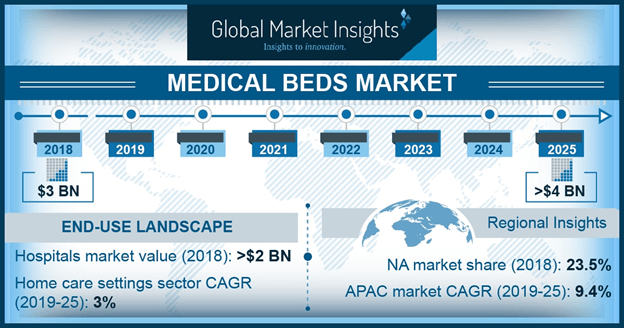 North America medical beds market witnessed over 23% revenue share in 2018 and is anticipated to grow exponentially over forecast timeframe. Growing funding on healthcare infrastructure will drive the regional growth. The American Hospital Association conduct annual survey of hospitals in the U.S. Total staffed bed in U.S. registered hospitals were 897,961 in 2015. Moreover, of patient awareness about the benefits of early diagnosis will boost the North America medical bed market over the forecast period. Eminent industry players operational in Medical Beds market includes Antano Group, Getinge, Gendron, Besco Medical, GF Health Products, Hard Manufacturing, Hill-Rom Holdings, Midmark and Invacare. These industry players adopt strategies such as geographic expansion, acquisition, merger and new product launch to sustain market competition. For instance, in July 2015, Stryker signed agreement to acquire Muka Metal, A.S., a turkey based seller of medical bed, stretchers and related furniture. The acquisition extended Stryker’s offering in Turkey as well as other regions of the world resulting in leading to geographical expansion.